With baby Charlie's due date just around the corner, the amazing Alice Fotheringham, recipe developer from the organic baby food company Piccolo did the first 'Piccolo Pop In' of 2017 in my kitchen. Alice helped me to prepare lots of healthy tasty meals for the whole family to enjoy! One of our New Year's Resolutions was to prepare a meal plan and try sticking to a shopping budget for our family food shop. Alice is a professional, she has been doing this for years so she has passed on some of her knowledge & I'd like to share it with you. You'll find a whole list of recipes at the end of this post. I can only imagine that as I become a mum of 2 under 2 my time will be super restricted. This is when making unhealthy choices can become all too easy and it's harder to break these poor habits once you start. Alice's advice? Prepare in advance. Take a day of the week and batch cook lots of meals that can be frozen or easily taken from the fridge and heated for dinner time. Buying little storage pots for individual meal portions can be really helpful. I used the Maxi food storage tub from Beaba as they are suitable for use in the freezer and the microwave which makes things a bit more convenient. I'm going to use a Sunday to prepare my weekly meals as Ella stays with grandparents on that night and Fraser is always off. I think a Sunday works best too as it's a new start to the week and it feels like we are doing things in the right order! Don't be afraid to use lots of different herbs & spices when cooking for your little ones, this is what grasps the attention of those tiny taste buds to keep them interested. Luckily for us, Ella is a fantastic eater, she will try something if she sees us eating it which is great that she is learning from example - only if we are giving her the best example to follow! Sometimes it's difficult to stay focused or enthusiastic when your child doesn't want to eat something but it's important to try and remain positive. Keep trying! They may not like something the first time they try it but that doesn't mean that a 2nd, 3rd or 4th time later they'll not give it a go. If you're getting nowhere then it's okay to accept that they don't like a particular thing, it's normal. We are going through a stage at the moment where Ella doesn't like the texture of pasta but that's OK, we will keep trying because it was her favourite once before and that could be the case again sometime. I can't really expect her to like everything she is handed, that's what makes her individual and having her own taste. Giving your child a whole host of different flavours and tastes in the weaning and early eating stages will help to broaden their palette range. We liked to give Ella things like lemons that are sour and also spicy foods to see how she reacted with them. This is great to educate your little one about the variety of foods and flavours plus it's so fun to see them with a citrus fruit! Here are some of my favourite healthy recipes for toddlers and some kids lunch ideas that Alice left for us to try. In a large saucepan heat the olive oil and add the onion and gently fry for 6-8 minutes until the onions are translucent and soft. Add the garlic, spices and ginger and cook for a minute. Add the grated sweet potato and stock and bring to the boil and simmer for five minutes until the potato is tender. Remove from the heat and add the coconut milk if you would like a creamier soup. Cool briefly before whizzing with a blender until smooth. Sprinkle with coriander and serve with warm bread. These are a quick, no fuss, and more importantly minimum mess, snack or breakfast. Pour the oats into a small, flat bottomed microwave proof dish and pour over the milk. Add the cinnamon and mix together. Press the oat mix down into the dish with the back of the spoon and cook in the microwave for 2 minutes on high. Cut into fingers and serve once cool. If you don’t want to use the microwave, these work just as well in the oven. Heat the oven to 190C/375F/Gas Mark 5 and cook for 15 minutes. Preheat the oven to 180°C/ 350°F/ Gas mark 4. Generously grease a muffin tin with sunflower, rice bran or olive oil and place the ham slices into the tin to form a cup, you may need two slices of ham to ensure there are no gaps in the muffin cup. For a baked egg, put any vegetables you would like in the bottom of the cup and break the egg directly on top. For a scrambled egg cup, mix the vegetables with a beaten egg and pour into the cup. Place in the oven for 10-15 minutes. Note the scrambled egg cup takes less time to cook through than the baked egg. Try making fishcakes with tinned fish. Tinned sardines, mackerel and salmon is a great source of omega 3, and tinned sardines and mackerel contain vitamin D, which is much harder to find in foods. Put the potatoes in a pan of cold water and bring to the boil, cooking for around 20 minutes or until soft. Remove from the heat, drain and mash with the butter and parmesan. In a bowl mash the drained fish with a fork, checking for any large bones that might be there. Add the eggs, onion, lemon zest, mustard, spices and parsley and mix well. Add the mashed potatoes to this and mix until well combined. Using your hands make into round patties coating with flour or breadcrumbs. Heat the oil in a frying pan over a moderate heat. Cook the cakes for a few minutes on each side until browned and heated through. These last in the fridge for one day refrigerated. 250g dried prunes, ensuring all pits are out. Either soak the prunes in the water over night or put the prunes and water in a pan and gently simmer for 5 minutes. Once you have soaked the prunes over night or cooked for 5 minutes, add the lemon juice and whizz up with a hand blender until smooth. Store in a clean, sterilised airtight jar in the fridge for around 2 weeks. This fragrant Bolognese herby Bolognese is delicious on its own or with this yummy carrot and sweet potato topping. Perfect batch cooking recipe. Preheat the oven to 220°C/428°F/ Gas Mark 7. Start with the potato topping. Put the sweet potato and carrot pieces in a large pan with a lid and add enough cold water to cover. Bring to the boil, then reduce the heat and cook for 20-25 minutes until both vegetables are soft and easily pierced with a knife. While these are cooking you can start with the filling. Either place the onion, garlic and ginger in a food processor and whiz until finely chopped, or chop finely yourself. Heat the olive oil in a deep heavy bottomed pan with a lid and tip these ingredients in. Cook for a few minutes to soften, stirring frequently. Then stir in the garam masala, turmeric and chili flakes. Tip in the meat, mixing it into the onion mix and allowing it to brown all over, breaking up any lumps. Once browned all over, add the tomatoes, filling the empty can with water, swilling it around and pouring into the pan as well. Add the lentils and stir. Season with salt and pepper and Worcester sauce and redcurrant jelly. Bring to a bubble, reduce the heat and put on the lid. Simmer for around 25 minutes, stirring a few times to stop it sticking at the bottom. When the sweet potatoes and carrot are cooked , drain them, reserving the liquid. Mash the vegetables, adding in some of cooking liquid if needed to make a more mashable consistency. Season with salt and pepper and a dash of olive oil. For a bit of zing you can grate over some lime zest and a squeeze of lime. Once the meat filling has had its time, ladle into either four oven-proof bowls or a large oven proof dish (approx. 30x20x5cm deep) and top with the mash. Place in the oven (you can place an oven tray underneath to catch any drips), for 10-15 minutes for individual portions, or 30 minutes for larger dish. The mash should be piping hot. This delicious banana bread uses dates to sweeten it. But you can simply replace with sugar if you would prefer. Preheat the oven to 170°C/325°F/ Gas Mark 3. Grease and line a loaf tin. In a small pan add the dates and a enough boiling water to just cover the bottom of the pan. Cook on a low heat for 5 minutes to soften the dates. Remove the heat and set aside. Sieve the flour, baking powder, bicarbonate of soda and salt in a bowl and mix together. Drain the liquid from the dates and in a separate large bowl or food processor combine the oil with dates and beat together until blended. Add to this the eggs, then the mashed banana and lastly the vanilla or nutmeg. Gently mix together. Add the flour mix and fold or beat in together until fully mixed together. Pour into a greased loaf tin and bake in the middle of the oven for 1-1 ¼ hours, until golden brown and on inserting a knife or skewer, it comes out clean. Leave the loaf to cool slightly before turning out onto a wire rack. 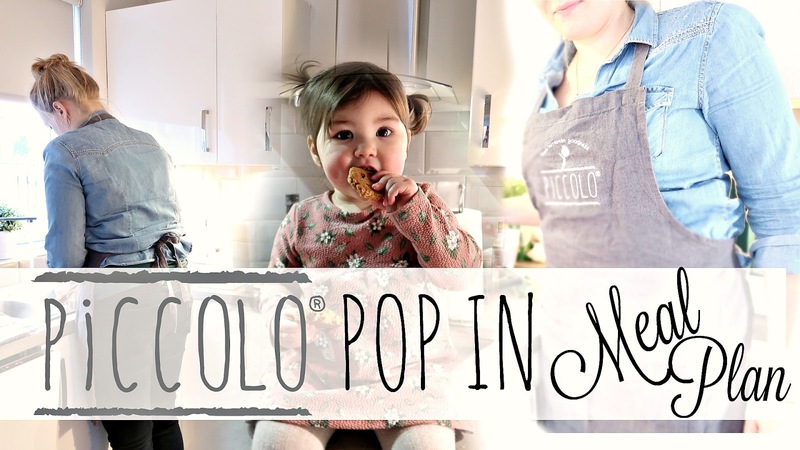 1 comment on "PICCOLO POP IN | EASY, HEALTHY MEALS FOR BABY & FAMILY"